UV Transmission and Power Meter. 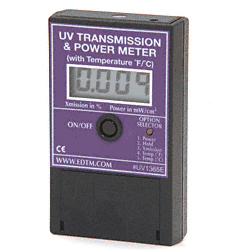 This UV Transmission and Power Meter is the most versatile product available for measuring UV. You can measure UV intensities (irradiance), UV Transmission percentage. This UV Transmission and Power Meter is the most versatile product available for measuring UV. You can measure UV intensities (irradiance), UV Transmission percentage. Perfect for checking the output of your UV curing lamps, you can even confirm the protection level of your UV spectacles, goggles and facemasks. An added feature allows you to also measure temperatures in Fahrenheit and Celsius. Unlike other UV products on the market, this Meter is extremely simple to operate. The digital display is continually updated with real-time readings. Powered by a 9-volt battery (included). Minimum order is one each.